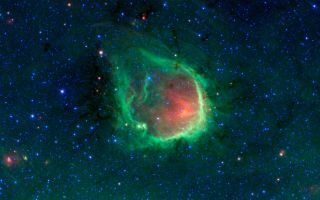 This glowing emerald nebula seen by NASA's Spitzer Space Telescope is reminiscent of the glowing ring wielded by the superhero Green Lantern. This cool space wallpaper shows a glowing emerald nebula as seen by NASA's Spitzer Space Telescope which is reminiscent of the glowing ring wielded by the superhero Green Lantern. In the comic books, the diminutive Guardians of the Planet "Oa" forged his power ring, but astronomers believe rings like this are actually sculpted by the powerful light of giant "O" stars. O stars are the most massive type of star known to exist. Named RCW 120, this region of hot gas and glowing dust can be found in the murky clouds encircled by the tail of the constellation Scorpius. The ring of dust is actually glowing in infrared colors that our eyes cannot see, but show up brightly when viewed by Spitzer's infrared detectors. At the center of this ring are a couple of giant stars whose intense ultraviolet light has carved out the bubble, though they blend in with other stars when viewed in infrared.